For those who do not have enough time or they just want to scape for a long weekend, this surf package is what you need! From beginners to advanced surfers, take some days off and join us in Baleal for the best waves in Europe. The small groups permit to have more focus on your improvement, more attention and you will feel the results, even in just a short course. You will stay at Alex Surf Hostel that has shared rooms, private rooms and private rooms with a bathroom. It was built in 2016 so everything is fresh and new. There is a shared kitchen, living room, and backyard. You will be able to use everything and to cook as much as you want. When one thinks of surf camp, what comes to mind, besides perfect waves every day? Great accommodation apartments, and effective surf lessons, that is what it is. Since this is Peniche, the wave part is more than covered, which leaves you with the before mentioned. The surf course or surf lesson involves all that is related with the surfing experience, this means learning not only how to ride waves with a surfboard, but all it takes before and after those magical moments in the ocean, thus improving your chances for better rides in the future. Relax and have safe fun, by choosing Alex Surf school, you are in good hands! It is all about quality, so the surf lessons have the limit of six individuals per teacher, so you get guaranteed attention, essential to progress. Alex Silva is a local surfer, who practices the sport for 20 years. His passion for surfing led him to want to share his knowledge acquired over time, thus becoming a surf instructor, something that he has been doing for over 12 years. His wide experience of the Peniche area allows him to know the best spots to surf and enjoy good times. This surf camp could not be any closer to the best surf spots. 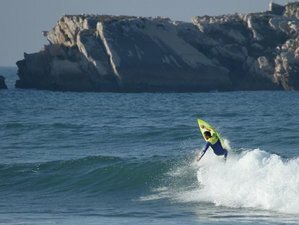 The surf school in Baleal, Portugal, four kilometers from Peniche and 65 from Lisbon Portela Airport (LIS). The surf house is in Avenida do Mar, just five minutes walk to the beach and close to supermarket, restaurants, and bars. Peniche and specially Baleal have the laid-back style very characteristic of Portugal and the Portuguese, but also, due to all the international visitors and residents, Baleal is like the Surf city within the Surf capital that is Peniche nowadays. But do not worry, it is still a lovely village where life goes as slow or as fast as you wish. The surf possibilities are immense, almost endless, so do not stress about the crowd at the more obvious surf spots there is always several alternatives, that Alex will provide and show you. Alex Surf School doesn't offer meals but there are plenty of restaurants around with local fish, veggies, and meat for really good prices. More than surfing you can also do some sightseeing here. Visit the magical and medieval city of Obidos, the natural paradise of Berlenga Island, walk around Peniche coastline, or visit the world famous Nazare. From Terminal 1 on Lisbon Portela Airport (LIS), you have an airport shuttle that will take you directly to Sete Rios bus station. From there you can get a bus to Peniche (one and a half hours) and from Peniche to Baleal, the best way is to get a taxi. The cheapest way to arrive in Peniche is by bus from Lisbon station Sete Rios. If you are beginner, intermediate or an advanced surfer, Alex Surf School knows how to take your surf to the next level and enjoy the feeling of surfing.